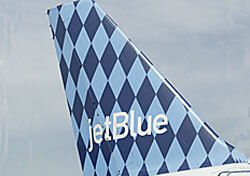 Folks in three Northeast cities now have new reasons, besides discounted airfare and in-flight DirecTV, to fly the low-cost carrier JetBlue. The airline recently announced two new routes from Boston’s Logan International Airport. With these routes, JetBlue will serve 27 destinations from Boston, including more cities in California than any other airline. And, residents of Buffalo and Syracuse will be able to warm up to new Ft. Lauderdale routes from each city, beginning November 1. A daily nonstop flight from Boston to San Diego begins service today, and a weekly nonstop flight to Aruba will be available on Saturdays beginning June 30th. Nonstop flights to Aruba will increase in November to three flights per week on Mondays, Wednesdays, and Saturdays. If, however, you’re willing to stop in New York at JFK airport, which can be an absolute nightmare, you can reach Aruba daily from Boston. JetBlue is like the little airline that could, and it’s making its way up that hill by continuing to add new routes while keeping fares low. It’s really no wonder that competing airlines like Southwest need to come up with new strategies to combat its staying power.